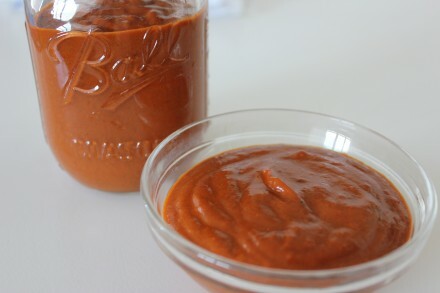 Harissa is a North African chile sauce that can vary from region to region, even family to family. 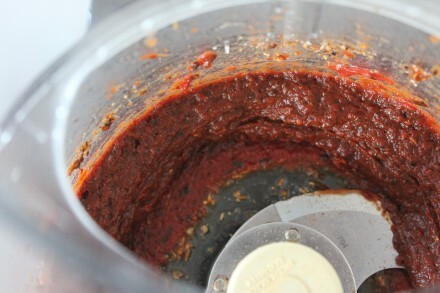 I like the addition of tomato paste to mellow out the chiles and to make it more of a sauce than a paste. It is so versatile – use it to marinate chicken, beef, or shrimp, add it to canned crushed tomatoes to make a delicious pasta sauce, or add some plain greek yogurt to make a creamy dip or sandwich spread. I could continue but I will spare you for now. I do not have a mortar and pestle so I used two little glass bowls (one smaller than the other) to smush the coriander. It worked quite nicely! Bring a small pot of water to a boil (4-5 cups). Remove stems and seeds from chiles, place in a bowl along with boiled water, cover and let sit for 1 hour. 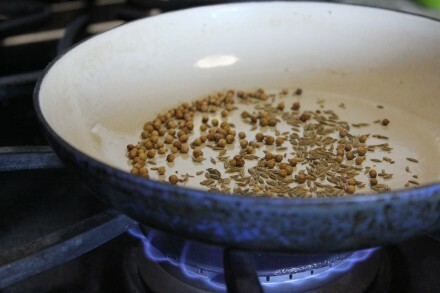 Toast the coriander and fennel seeds in a dry sauté pan until fragrant (1-2 minutes, keep a close eye on the spices as they can burn very easily). 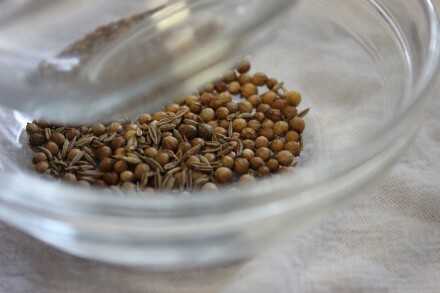 Using a mortar and pestle, spice grinder, or whatever you have on hand, grind up the coriander and fennel – it does not have to be finely ground, about the consistency of coarse black pepper. 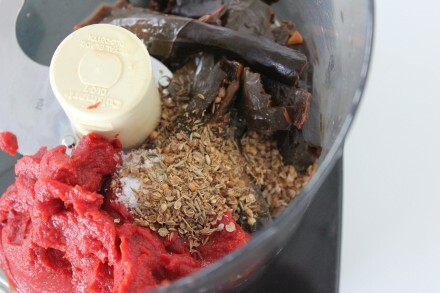 Combine everything except olive oil in a food processor (fitted with blade attachment) and blend about 30 seconds, until everything is incorporated, then drizzle in the olive oil, continuing to blend until smooth. Season with salt and pepper to taste. *chiles are tricky in that you can never be sure of their heat until you take a bite – that being said, there are general guidelines that can help. 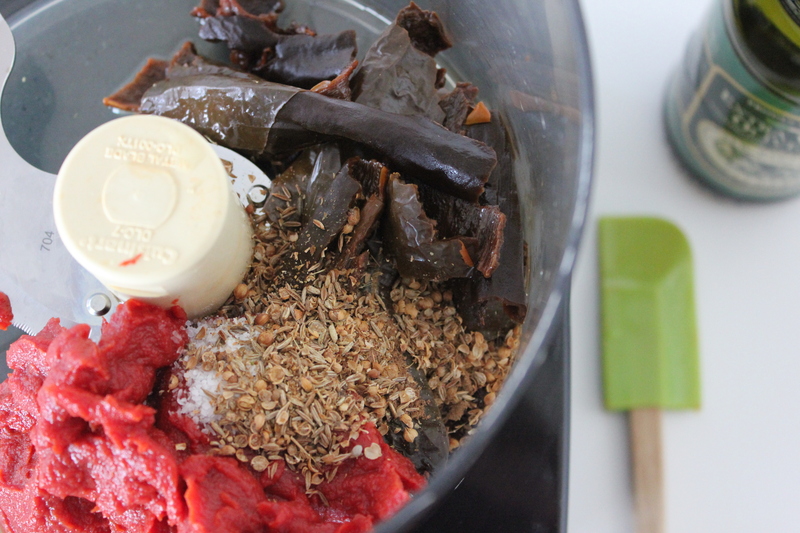 For milder heat, use pasilla or ancho chiles. For extra heat, use chiles de arbol or chipotle chiles (chipotles are smoke-dried jalapeños and therefore add great depth of flavor along with a kick in the mouth).